Manuscript received 18 February 2016; revision received 23 February 2016; accepted 19 December 2016. Since the global financial crisis, many central banks around the world have introduced financial stability as one of their key mandates. This is mainly driven by the change in policymakers’ views that a central bank’s role is very important in achieving macroprudential soundness in the economy. Especially when there is either too much or too little credit supply in financial markets, there has been a growing demand for aggressive actions by central banks. On the other hand, it is expected that policy authorities around the world will introduce counter-cyclical capital buffers (CCB) in the near future. The main purpose of a CCB is to accumulate a capital buffer during boom periods, which can be used to protect banks and help them carry out their financial intermediation functions steadily, even during periods of recession. One of the other important aims of a CCB is to reduce the build-up of financial risk in advance. As the levels of required CCB can vary over business cycles or credit cycles, it is evident that the CCB policy affects output and inflation, which are the main target variables for monetary policy. This makes the coordination between macroprudential policy and monetary policy one of the most important tasks for policymakers. There has been some research on the coordination between monetary and macroprudential policies. Several studies have analyzed the coordination issue with DSGE models. For example, Angelini et al. (2012), using a DSGE model with the banking sector, analyze the European financial market and argue that macroprudential policies are beneficial, especially when there are shocks in the financial or housing markets as opposed to shocks from the supply side. Beau et al. (2012), with a DSGE model for the euro area, find that macroprudential policies have either a limited or a stabilizing effect on inflation. Paoli and Paustian (2013) set a DSGE model with nominal rigidities and credit constraints, finding that if faced with cost-push shocks, policy authorities must cooperate and commit to a given course of action to maximize the level of social welfare. Though these DSGE models are capable of measuring the relative effectiveness of macroprudential policies compared to monetary policies, they have limitations when used to analyze one policy authority’s response to another’s actions, not to mention the fact that the results depend on the details of parameter calibration. The second strand of studies in this area directly derives agents’ response functions. Cecchetti and Kohler (2014), using a simple model, analyze the behavior of policy authorities. In the full cooperation situation, they find that capital adequacy requirements and policy interest rates can substitute for each other to meet the objective of stabilizing prices and output volatility levels,1 whereas the relationship does not hold when policymakers try to achieve financial stability as well as price and output stability at the same time. Hence, they argue that policymakers need to coordinate macroprudential and monetary policies. Using a model with fiscal and monetary authorities, Davig and Gürkaynak (2015) demonstrate that if the fiscal authority has an additional mandate that is unrelated to social welfare, then social welfare maximum cannot be achieved. On the other hand, Smets (2014) notes that if macroprudential instruments are not effective, then monetary policy instruments can be used to stabilize the financial market. In many papers, including those by Cecchetti and Kohler (2014) and Paoli and Paustian (2013), loan interest rates or the gap between loan interest rates and the policy interest rate are used as a financial stability indicator. What brings about a financial market crisis is an excessive expansion of the credit supply rather than credit demand. Considering that the gap between loan interest rates and the policy interest rate tends to expand when the loan supply as well as loan demand increase, responding to changes in the gap may mislead policymakers. As a financial stability indicator, this paper employs the credit-to-GDP ratio.2 Drehmann et al. (2011) and Drehmann and Juselius (2013) from the BIS suggest that it is desirable to use the credit-to-GDP ratio, as it performs better than any other indicator when predicting a financial crisis. When the level of credit demand expands, both the numerator and denominator of the credit-to-GDP ratio tend to increase simultaneously, leaving the ratio relatively stable. These authors also propose that in order to remove the effects of structural changes in the financial market, the cyclical components of the credit-to-GDP ratio must be used as an indicator of financial stability. This paper considers whether the two policy response functions converge to an equilibrium point and examines the factors affecting the stability of equilibrium and the speed of convergence to equilibrium. These issues considered in this paper were not examined in earlier work which studied the relationships between policies, including Cecchetti and Kohler (2014), Davig and Gürkaynak (2015) and others. In Cecchetti and Kohler’s (2014) non-cooperation situation, each agency assumes that the other agency’s policy is fixed and does not change. Thus, each agency’s optimal policy does not depend on the other agency’s action, and there is no interaction between policy authorities. This makes Cecchetti and Kohler (2014) unable to examine the stability of equilibrium and the speed of convergence. The main results of this paper are as follows: First, the paper examines whether the two policy response functions converge to a single point, finding that the condition of convergence depends on policymakers’ objectives and on the structure of the economy. A non-convergence outcome can arise when the FSA places too much emphasis on output gap stability in its loss function or when a stronger financial stability mandate is assigned to the CB, which does not have proper macroprudential tools besides the policy interest rate. Second, this paper compares the effectiveness of assigning mandates to each of the policy authorities, which have a limited number of policy measures. It finds that assigning a small number of mandates is more desirable than assigning a large number of them, as equilibrium can be more quickly restored in the former case than in the latter. Previous studies examining the assigning of mandates to agencies are rare. Davig and Gürkaynak (2015) examine the relationship between fiscal and monetary policies. They show that if the fiscal authority focuses only on reducing output volatility and the central bank concentrates on reducing inflation volatility, then social welfare, i.e., minimizing output volatility and inflation volatility, can be maximized. They also show that if the fiscal authority has the additional objective of minimizing tax rate volatility, then social welfare cannot be maximized even when the central bank attempts to minimize both inflation volatility and output volatility. This result is not surprising, as Davig and Gürkaynak (2015) assume that the fiscal authority’s new objective, minimizing tax rate volatility, is not related to social welfare. In addition, this assumption cannot be regarded as reasonable because a mandate that does not improve social welfare is assigned to an agency in such a case. They also assume that the fiscal authority takes into account the CB’s response function while the CB does not consider the fiscal authority’s response function. This indicates that their result comes from a model of the fiscal authority as a leader and the CB as a follower. This paper does not introduce any mandate unrelated to social welfare and derives the result in the context of a non-cooperative situation. As all of the assigned mandates are related to social welfare in this paper, social welfare optimum can be achieved at equilibrium. Thus, this paper does not compare the levels of social welfare between different settings of mandates in a state of equilibrium. Instead, the paper compares differences in the speed of restoring equilibrium between the different settings of mandates among agencies. The speed of restoring equilibrium is important in the sense that it is closely related to dynamic movements of social welfare. Maximum social welfare can be achieved when policy measures such as the policy interest rate and the regulatory capital ratio are in equilibrium. The further the policy measures deviate from equilibrium, the smaller the social welfare. In addition, the longer the period policy measures are not in equilibrium, the greater the loss of social welfare. When external shocks occur in the economy, the policy measures need to move to a new state of equilibrium. If they swiftly converge to this new state, social welfare can be maximized speedily, reducing the loss of social welfare caused by the deviation of the policy measures from this new state. Third, assuming a full cooperation situation, Cecchetti and Kohler (2014) find that the two policy instruments can be substituted when the agencies have two objectives, whereas they are not substitutable when the agencies have the additional objective of financial stability. This paper examines whether the two instruments are substitutable in the non-cooperation situation, finding that even when the financial stability mandate is assigned to the central bank, there is a substitution relationship between the two instruments. This paper derives policy response functions from a simple model, as in the second strand of studies. The model is composed of the IS curve equation, the Phillips curve equation, and the credit-to-GDP ratio equation. There are two types of policy authorities: monetary and financial supervisory authorities. As policy instruments, the central bank (CB) has the policy interest rate and the financial supervisory authority (FSA) has the counter-cyclical capital ratio. Each policy authority has its own loss function and exercises its policy measure to minimize loss. Solving the minimization problem of each policymaker’s loss function provides their policy response functions, which are expressed in terms of the inflation gap, the output gap, the credit gap and the other policymakers’ policy measures. Monetary policy can affect the real economy through many different channels. Among them, the interest rate channel and the credit channel are the most important ones. The credit channel means that the credit supply can affect the real economy (Disyatat 2010). The credit-to-GDP ratio is known to reflect the credit supply well (Drehmann et al. 2011, Drehmann and Juselius 2013). The credit supply can also affect inflation as liquidly is created by credit in the banking system and liquidity itself determines inflation according to the quantity theory of money. Considering this, the credit-to-GDP ratio is included in the IS and Phillips curves. To construct the model, the equations for the IS curve and the Phillips curve are used, along with the equation for the credit-to-GDP ratio. Considering that generally, economic agents forecast future inflation based on information available at a current point in time, the IS curve in equation (1) is introduced.3 Output (yt+1) is affected by the real policy interest rate (it − Et[πt+1]) and the credit-to-GDP ratio (cyrt+1), inflation(πt+1) by the output gap ( ) and the credit-to-GDP ratio,4 and the credit-to-GDP ratio by the real policy interest rate and the regulatory capital ratio (cart).5 The two policy measures, the nominal policy interest rate (it) and the regulatory capital ratio, affect the three endogenous variables — output, inflation, and the credit-to-GDP ratio — with a time lag. Policymakers adjust their instruments preemptively on the basis of their expectations with regard to the next period’s output gap, inflation gap and credit-to-GDP ratio gap (credit gap hereafter). After taking Et[·] on both sides of equations (1)~(3), the equations are rearranged into Et[πt+1], Et[yt+1] and Et[cyrt+1]. They can then be expressed in terms of the two policy measures as the following equations (4)~(6). The sign of Φ in the three equations above and that of (1 − a2b2) in equation (6) need to be positive for the effects of the policy interest rate and the regulatory capital ratio on output, inflation and the credit-to-GDP ratio to have the expected signs. Let be the expected value of xt+1 at time t when Δit = 0 and Δcart = 0, which means that there is no change in the policy measures from the previous period. Let Δit be it − it−1 and Δcart be cart −cart−1. The expected values of the three endogenous variables above can then be expressed in terms of their values in the absence of policy changes and changes in the policy variables by the following functions (7)~(9). The optimal policy interest rate, which minimizes the above loss function with respect to Δit , is expressed by the following equation (11) in terms of the inflation gap, the output gap, the credit gap and the regulatory capital ratio. The FSA may have different objectives from the CB, and its decision and optimal behavior tend to vary depending on its objectives. This section considers three cases according to how many objectives the FSA has. The optimal regulatory capital ratio is derived as a function of the credit gap and the policy interest rate. Note: The solid (dotted) line is the response function of the CB (the FSA), and Ωt is the set of information available at time t.
In this situation, where the FSA focuses on reducing credit gap volatility, the condition of convergence is satisfied as the following equation (15) is always positive. In this case, the FSA’s loss function is expressed as a function of the output gap volatility as well as the credit gap volatility. When the FSA has keen interest in maintaining microprudential stability, supporting individual banks’ profitability is important, which can again be backed by improving business activity overall. In this sense, the FSA may have a great deal of interest in reducing the output volatility relative to the credit volatility, causing the value of κ in equation (16) to decrease.13 The solution of the loss-minimizing function (16) produces the optimal regulatory capital ratio in terms of the credit gap, the output gap and the policy interest rate. The condition for convergence of the response functions can be expressed by equation (18). This condition is met only when the value of κφ1 in the numerator on the right-hand side of equation (18) is greater than the value of φ2. When the FSA has more interest in output stability than in financial stability, the value of κ decreases, increasing the possibility of non-convergence.14 This result implies that it is desirable for macroprudential measures to be used primarily for lessening the credit gap, but not for lessening the output gap. Meanwhile, when the CB has a strong mandate of financial stability, the values of δ and φ2 in equation (18) increase, increasing the likelihood of non-convergence. Either an increase in the value of δ or a decrease in κ also tends to reduce the speed of convergence to equilibrium.15 A large value of γ indicates that the CB considers output stability as an important task. The relationship in equation (18) indicates that if the value of γ increases, the probability of convergence and the speed of converging to equilibrium tend to rise. In this case, the FSA has the same loss function as the CB, as in equation (10), and it uses the regulatory capital ratio to minimize the function. The FSA’s optimal regulatory capital ratio is determined by equation (19). When each of the three gaps expands and the policy interest rate falls, the FSA raises the regulatory capital ratio. In this case, with the same objective function, the condition for convergence of the response functions is expressed by the following equation, and the condition is satisfied. This section examines whether assigning a small number of mandates to authorities is more effective than assigning a large number of them when the policy authorities act in non-cooperative situations. Davig and Gürkaynak (2015) used the context of a lead-follower situation to study additional objectives of the fiscal agency which are unrelated to social welfare. This setting naturally leads to the outcome of a suboptimal level of social welfare at equilibrium. Unlike Davig and Gürkaynak (2015), this paper considers the case where all of objectives assigned to the agencies are related to social welfare in a non-cooperative situation. As all of the objectives are related to social welfare, the social welfare optimum can always be achieved in equilibrium. The speeds of restoring equilibrium, however, differ with different settings of mandates. Comparing the speeds of restoring equilibrium, this paper evaluates the effectiveness of assigning mandates to agencies. For this analysis, two situations are considered: one with a single objective for each policy authority and the other with multiple objectives. In both situations, the CB has the policy interest rate as its own instrument, and the FSA has the regulatory capital ratio. In the first situation, the CB’s objective is to reduce inflation gap volatility while the FSA’s objective is to reduce credit gap volatility. With one objective and one policy measure for each policymaker, each gap becomes zero at equilibrium. The CB’s optimal policy interest rate is that satisfies , and the FSA’s optimal regulatory capital ratio is that satisfies . In the second situation, each authority has two objectives: reducing inflation gap volatility and credit gap volatility with its own instrument. As the economy in this situation has two objectives and two policy measures as a whole, each gap converges to zero at equilibrium following the Tinbergen rule. Thus, in a state of equilibrium in the second situation, the same outcome can be obtained as in the first situation. Let the CB and the FSA have the following equations (21) as their objective functions. The CB’s optimal policy interest rate, , must satisfy the relationship of and the FSA’s optimal regulatory capital ratio, , needs to do the same for . For each of the two situations, the policy response functions and the speed of convergence to equilibrium can be derived. 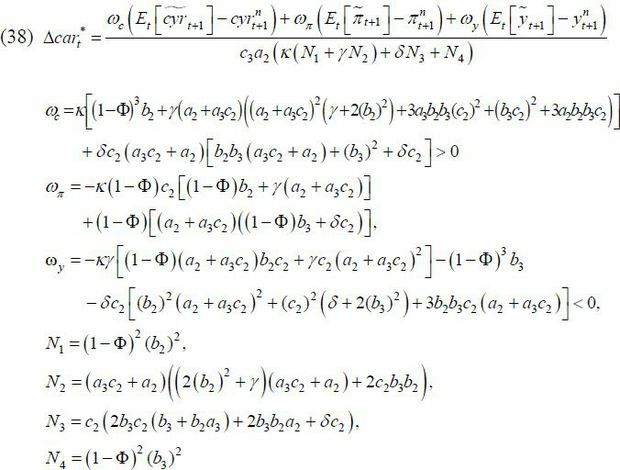 The optimal policy is expressed by the following equations (22) ~ (25). The speed of convergence for each situation is derived using the following equations (26)∼(27). The higher the following value is, the faster the speed becomes. The difference between the speed of convergence with a single objective and that with multiple objectives is expressed by equation (28). The speed of convergence to equilibrium is faster in the first situation than in the second situation, while the equilibrium outcomes are identical. This implies that the first situation with a single objective for each policy authority is a more desirable means of achieving the objective compared to the second situation. At this stage, we consider the difference between assigning one objective to each institution and assigning one to an institution and two to the other. It is found that the former way still more quickly arrives at the equilibrium point. Let the speed of convergence when assigning one objective to each institution be SW11, let assigning two objectives to the CB and one to the FSA be SW21, and let assigning one to the CB and two to the FSA be SW12.17 The differences between SW11 and SW21 and between SW11 and SW12 are then expressed by (29) and (30), respectively. There are several caveats with regard to this result. If the objective of the CB is to reduce credit gap volatility while the objective of the FSA is to reduce inflation gap volatility, then the policy response functions do not converge — a situation that there is uncertainty in either the effectiveness of the policy instruments or the objectives of each policy authority, then it is more effective for each authority to pursue multiple objectives than a single objective, as mentioned by Smets (2014).18 Finally, there may be differences between the CB’s evaluation of the gaps and the FSB’s evaluation. As the CB has more information about the macro-economy than does the FSB, the CB is more likely than the FSA to assess the gaps accurately. In this case, assigning multiple objectives would produce a better outcome. If the CB and the FSA have the same objective, they can then decide fully to coordinate and exercise the two instruments simultaneously in order to achieve their common goal. This full cooperation equilibrium can also be applied to a case in which the CB can exercise the regulatory capital ratio as its instrument. The two authorities’ common loss function is expressed by equation (31). In the case of full cooperation, the optimal policy interest rate and the optimal regulatory capital ratio are expressed in terms of the output gap, the inflation gap and the credit gap as equations (32) ~ (33). Equation (32) shows that the optimal policy interest rate rises either when the output gap expands (θy > 0) or when the credit gap shrinks (θc < 0). As the regulatory capital ratio rises when the credit gap expands, it may be effective for the CB not to raise the policy interest rate in response to the credit gap expansion and to focus on the other objectives instead. The CB’s response to the inflation gap (θπ) varies depending on the preferences and the values of the parameters. When either the effect of the output gap on inflation (b2) is large or when the weight of the output gap in the loss function (γ) is relatively small compared to that of the credit gap (δ), the optimal policy interest rate rises in response to the widening inflation gap (θπ > 0). While the optimal regulatory capital ratio rises in equation (33) either when the credit gap expands (μc > 0) or when the output gap shrinks (μy < 0), its response to the inflation gap (μπ) depends on the parameter values. This result implies that monetary policy and macroprudential policy must be focused on areas where they have a comparative advantage over each other in exercising policy measures. In this case, the loss function can be expressed in terms of the three gaps by equation (34). This indicates that when the three gaps converge to zero, so does the value of the loss function. Meanwhile, when the two authorities have the same objective function, noncooperation equilibrium converges to full cooperation equilibrium. In terms of social welfare, however, non-cooperation equilibrium may be inferior to full cooperation equilibrium, as it requires a certain period of time for convergence. An agent may act as a Stackelberg leader. Previous studies have considered the FSA as a leader and the CB as a follower, as the policy interest rate can be changed frequently while the regulatory capital ratio cannot. When the FSA is a leader, it can move first as it knows the CB’s response function, which is used as one of its constraints. One of the necessary conditions for an agent to become a leader is that it needs to know the others’ response functions. Monetary policy tends to follow a rule similar to the Taylor rule, while the FSA prefers to use its discretion in exercising its measures. This could make monetary policy more predictable than macroprudential policy, making it easier for the FSA to behave as a leader. Here, we assume that the loss function of the FSA is and that the CB’s response function is . The FSA then derives the optimal regulatory capital ratio to minimize its loss function, as in equation (35). When the FSA’s objective is to minimize credit gap volatility, as shown in equation (12), its optimal policy is expressed by equation (36), which shows that the optimal regulatory capital ratio depends not only on the credit gap but also on the inflation gap and the output gap. The FSA raises the regulatory capital ratio when the credit gap expands (ψc > 0) and lowers it when the inflation gap and the output gap expand ( ψπ < 0 and ψy < 0 ). As it expects that the CB will raise the policy interest rate in response to the expansion of the inflation gap and the output gap, the FSA focuses on reducing the credit gap, which is its sole objective. The FSA’s response to the gaps depends on the CB’s preferences and on other parameters. If a stronger mandate for output stability is given to the CB, the FSA’s response to the credit gap and the inflation gap becomes weaker and the response to the output gap becomes greater.19 This implies, as Davig and Gürkaynak (2015) predict, that an agent’s response to its objectives is affected by the structure of other agents’ loss functions. As information advantage enables an agent to become a leader, the CB may become a leader under certain circumstances. If the counter-cyclical capital ratio is exercised under a pre-committed rule, the CB could know the FSA’s response function, making it easier for the CB to become a leader. If the CB acts as a leader, it will minimize its loss function, as in equation (10), predicting the FSA responses according to equation (13) if the FSA’s objective is to reduce credit gap volatility. The CB’s optimal policy can be obtained by substituting equation (13) for the regulatory capital ratio (Δcart) in its loss function and minimizing it.21 This process produces the CB’s optimal policy in the form of equation (37). The policy interest rate rises when either the inflation gap or the output gap expands, and it falls when the credit gap expands. Table 1 in the Appendix shows that a leader is not trying to reduce all of the three gaps, leaving a follower to bear the burden. When the two policy authorities know each other’s response functions, both of them may try to become a leader. This situation can be referred to as a “leader-leader model.” In this situation, there is no convergence of response functions, and each authority sets its own instrument to maximize its utility function. Note: The solid (dotted) straight line is the response function of the CB (the FSA). The solid (dotted) ellipse is the indifference curve of the CB (the FSA). Ωt denotes the set of information available at time t.
An authority’s utility increases as the ellipse becomes smaller. If the FSA is a leader, it will set the regulatory capital ratio at point A, and if the CB is a leader, the policy interest rate is set at point B. Point A is optimal for the FSA in the long run. The FSA may temporarily increase its utility by moving leftward and downward from point A. Such moves, however, cause the CB to move alongside its response function line, eventually decreasing the FSA’s utility at that point compared to that at point A. Using the IS curve, the Phillips curve, the credit-to-GDP ratio equation and policymakers’ objective functions, this paper examines the interaction between monetary and macroprudential policies with different levels of cooperation between two policy authorities, i.e., non-cooperation, full cooperation, and the leader-follower relationship. When the policy authorities have the same objectives, then it is more likely that the authorities engage in full cooperation. If one of the policy authorities has more information about the other’s response function, it may act as a Stackelberg leader. In the model, the CB and the FSA can exercise the policy interest rate and the regulatory capital ratio, respectively, as their policy instruments. In the non-cooperation situation, each policy authority’s optimal response is to tighten its policy measures when the other authority’s policy measure is loosened. This substitutive relationship holds even when the CB has as its objective financial stability as well as inflation and output stability. Whether the policy response functions converge to equilibrium depends on the authorities’ preferences and the parameter values in the model. As the FSA places greater emphasis on output stability or when a stronger financial stability mandate is assigned to the CB, the possibility of non-convergence becomes higher and the speed of convergence to equilibrium tends to decrease, adding costs to policy operations. Meanwhile, if the CB considers output stability as an important task, the probability of convergence and the speed of converging to equilibrium are high. When the CB has the financial stability objective, the intensity of the response of the policy interest rate to the output gap and the inflation gap decreases compared to when the CB does not have a financial stability mandate. In the context of non-cooperation, this paper analyses the effectiveness of the manner in which mandates are assigned to authorities. Assigning multiple objectives to authorities with a limited number of policy measures may be less desirable when seeking to restore stability quickly as compared to assigning a small number of objectives. This condition arises because, in the situation with multiple objectives, more time is required for the policy response functions to reach a state of Nash equilibrium. It is also more difficult in such a case for policymakers to find the proper levels of policy measures, as the optimal policy response functions have more complex forms. When the policy authorities fully cooperate with each other, their responses to each gap are different. In response to the widening of the output gap, monetary policy tightening and macroprudential policy loosening are optimal. In the case of a credit gap expansion, the optimal responses would be a tightening of macroprudential policy and a loosening of monetary policy. The direction of optimal responses to the widening of the inflation gap depends on the economic structure and the preferences of the policymakers. An information advantage over the other party enables an agent to act as a Stackelberg leader. If the FSA acts as a leader, it raises the regulatory capital ratio in response to an expansion in the credit gap and to shrinkage in the output gap. On the other hand, if the CB is a leader, it raises the policy interest rate when the inflation gap and the output gap expand and when the credit gap contracts. In either of the above two cases, a leader attempts to reduce only one or two gaps among the three. The author is grateful to Woon Gyu Choi, Jin-Su Park, Jinill Kim, Myeongsu Lee, and the two anonymous reviewers for their thoughtful comments and suggestions. This means that when the regulatory capital ratio rises, the central bank must reduce the policy interest rate and when the policy interest rate cut the financial supervisory agency needs to raise the regulatory capital ratio to maximize their utility functions. The coefficient of correlation between the interest rate gap and the credit-to-GDP ratio was found to be −0.161 from the Korean data for the period of 2000.1q to 2015.4q. This low coefficient implies that using the credit-to-GDP ratio as an indicator of financial stability can be useful. If a forward-looking IS curve is introduced, a1yt on the right hand side of equation (1) can then be replaced with a1Et[yt+2]. In this case, the main result of this paper will still hold, as both Et[yt+2] and yt are known variables at time t and do not change due to changes in policy instruments such as it and cart. 4As credit and liquidity (or money) are two sides of the same coin, an increase in credit tends to increase inflation, fitting into the quantity theory of money. denotes the potential, natural or target value of xt +1. The credit gap refers to the difference between the credit-to-GDP ratio and its long-term trend or target level set by the authorities. Curdia and Woodford (2009) note that this type of loss function can be obtained when there is financial friction. On the other hand, we can also use this type of loss function when simply assuming that the CB has the three mandates and acts according to a Taylor-type rule. Cecchetti and Kohler (2014) use the gap between loan interest rates and the policy interest rate as an indicator of financial stability. In their model, a rise in the policy interest rate reduces the gap, while a rise in the regulatory capital ratio expands the gap. The value of Ã in equation (11) becomes larger when δ(c2)2 is included. For convergence, the slope of the response function of the policy interest rate ( ) in Figure (1) must be smaller than that of the regulatory capital ratio meaning that the relationship of must hold. Meanwhile, as the difference between the slopes of the two response functions expands, the value of equation (14) and speed of convergence both increase. The partial derivatives on the right-hand side of equation (15) with respect to γ and δ have a positive sign and a negative sign, respectively. As the FSA is a government body, which is influenced by national elections in the country, it may have short-sighted views, assigning greater importance to output growth than to financial market stabilization. In the model, the regulatory capital ratio directly affects the credit-to-GDP ratio, while the policy interest rate directly affects the output level as well as the credit-to-GDP ratio. This gives the policy interest rate a comparative advantage over the regulatory capital ratio in lessening the output gap and the inflation gap, and the regulatory capital ratio has this advantage over the policy interest rate in lessening the credit gap. Thus, it is not effective for the regulatory capital ratio to be used for controlling the output gap, as the regulatory capital ratio needs to change by a large amount to have a significant influence on the output gap. If the regulatory capital ratio moves in such a manner, the credit gap changes significantly, in which case the policy interest rate would also need to move greatly because the policy interest rate is not an effective instrument for controlling the credit gap compared to the regulatory capital ratio. This chain reaction can lead to non-convergence. The partial derivative of the right-hand side of equation (18) with respect to δ has a negative sign, while those with respect to κ and γ have positive signs. Changes in the structure of an economy tend to bring about changes in the parameters and the way policy instruments are operated. This adverse effect would be more significant in the multiple-objective situation than in the single-objective case. When one mandate is given to the CB (or the FSA), reducing the inflation (or credit) gap mandate is assigned. Davig and Gürkaynak (2015) also state that the FSA may be slow to act for various reasons, such as political considerations and the time lag in gathering and analyzing information. This relationship can be verified by determining with equation (36). Let DM36 be the denominator of equation (36). It is then found that ∂(ψc/DM36)/∂γ<0, ∂(ψπ/DM36)/∂γ>0 and ∂(ψy/DM36)/∂γ<0. The coefficient of the regulatory capital ratio’s response on the inflation gap is more likely to have a negative sign as the weight of the credit gap in the FSA’s loss function (κ) increases (see the Appendix). If the FSA’s objective is to reduce the volatility of the output gap as well as the credit gap, then equation (17) can be used for the substitution. If an authority has a single objective, then her indifference curve is expressed as a straight line. Angelini, P., Neri, S., & Panetta, F. (2012). Monetary and Macroprudential Policies. Beau, Denis, Clerc, Laurent, & Mojon, Benoit. (2012). Macro-Prudential Policy and the Conduct of Monetary Policy. Mimeo. Bank of France. Stephen, Cecchetti, & Marion, Kohler. (2014). When Capital Adequacy and Interest Rate Policy Are Substitutes (And When They Are Not). International Journal of Central Banking, 10(3), 295-231. Cúrdia, Vasco, & Woodford, Michael. (2009). Credit Frictions and Optimal Monetary Policy, IS Working Papers No. 278. Davig, Troy, & Gürkaynak, Refet. (2015). Is Optimal Monetary Policy Always Optimal? International Journal of Central Banking, 11, 353-384. Drehmann, Mathias, Borio, Claudio, & Tsatsaronis, Kostas. (2011). Anchoring Countercyclical Capital Buffers: The Role of Credit Aggregates, BIS Working Papers No. 355. Drehmann, Mathias, & Juselius, Mikael. (2013). Evaluating Early Warning Indicators of Banking Crises: Satisfying Policy Requirements, BIS Working Papers No. 421. Disyatat, Piti. (2010). The Bank Lending Channel Revisited, BIS Working Papers No 297. Paoli, Bianca, & Paustian, Matthias. (2013). Coordinating Monetary and Macroprudential Policies, Federal Reserve Bank of New York Staff Reports No. 653. Smets, Frank. (2014). Financial Stability and Monetary Policy: How Closely Interlinked? International Journal of Central Banking, 10(2), 263-300.